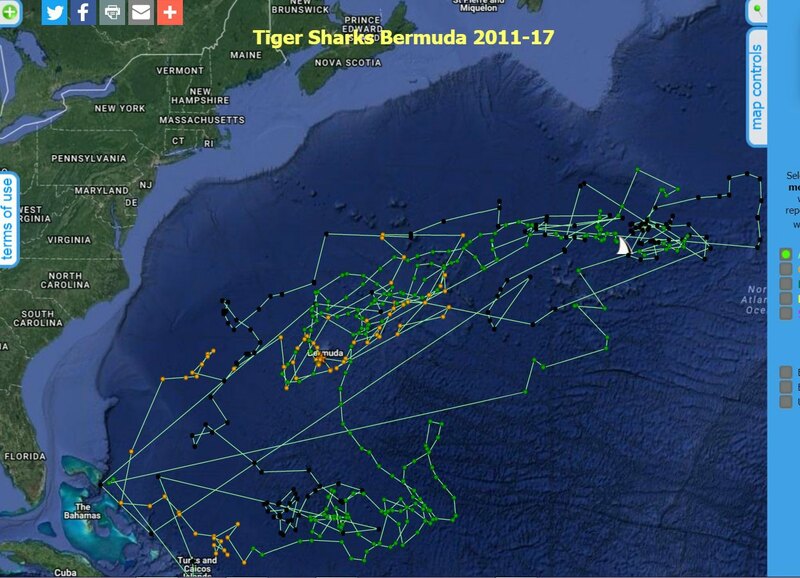 NSU’s Guy Harvey Research Institute Tagged Tiger Shark Breaks Distance Record – And Is Still Going! NSU’s GHRI has an extensive history of tagging sharks with satellite tags to study their migration patterns and interactions with fisheries. To date, more than 150 tiger, mako and oceanic whitetip sharks have been tagged with satellite tags around the world by GHRI researchers but Andy has surpassed them all. The satellite tags used in this study report a shark’s location every time the dorsal fin breaks the surface of the water. Because tiger sharks spend less time on the surface than other species, the battery in their tags tends to last longer than other tagged sharks, including makos. Shivji is also a professor in NSU’s Halmos College of Natural Sciences and Oceanography, and the director of the Save Our Seas Shark Research Center. Named after the angler who caught the shark for tagging, Andy has continued to add to the knowledge base of these wide-ranging animals and is still reporting from far out in the Atlantic, near the mid-Atlantic Ridge. Andy and all NSU GHRI tagged sharks can be followed online in near real-time at nova.edu/sharktracking. NSU’s GHRI western North Atlantic Ocean tiger shark study has shown definitive, seasonal migration paths of tiger sharks between Bermuda and the Bahamas. These findings, along with input from the Bahamas National Trust and Pew Charitable Trusts, were integral to proving the value of Bahamian waters to Atlantic tiger shark populations and compelled the Government of the Bahamas in 2011 to declare their federal waters a shark sanctuary, prohibiting the commercial harvesting of sharks. About Nova Southeastern University (NSU): Located in beautiful Fort Lauderdale, Florida, Nova Southeastern University (NSU) is a dynamic research institution dedicated to providing high-quality educational programs at the undergraduate, graduate, and first-professional degree levels. A private, not-for-profit institution, NSU has campuses in Fort Lauderdale, Fort Myers, Jacksonville, Miami, Miramar, Orlando, Palm Beach, and Tampa, Florida, as well as San Juan, Puerto Rico, while maintaining a presence online globally. For more than 50 years, NSU has been awarding degrees in a wide range of fields, while fostering groundbreaking research and an impactful commitment to community. Classified as a research university with “high research activity” by the Carnegie Foundation for the Advancement of Teaching, NSU is 1 of only 50 universities nationwide to also be awarded Carnegie’s Community Engagement Classification, and is also the largest private, not-for-profit institution in the United States that meets the U.S. Department of Education’s criteria as a Hispanic-serving Institution. Please visit www.nova.edu for more information about NSU and realizingpotential.nova.edu for more information on the largest fundraising campaign in NSU history. About NSU’s Halmos College of Natural Sciences and Oceanography: The college provides high-quality undergraduate (bachelor’s degree) and graduate (master’s and doctoral degrees and certificates) education programs in a broad range of disciplines, including marine sciences, mathematics, biophysics, and chemistry. Researchers carry out innovative basic and applied research programs in coral reef biology, ecology, and geology; fish biology, ecology, and conservation; shark and billfish ecology; fisheries science; deep-sea organismal biology and ecology; invertebrate and vertebrate genomics, genetics, molecular ecology, and evolution; microbiology; biodiversity; observation and modeling of large-scale ocean circulation, coastal dynamics, and ocean atmosphere coupling; benthic habitat mapping; biodiversity; histology; and calcification. The college’s newest building is the state-of-the-art Guy Harvey Oceanographic Center, an 86,000-square-foot structure filled with laboratories; offices; seminar rooms; an auditorium; and indoor and outdoor running sea water facilities. Please visit cnso.nova.edu for more information. About the Guy Harvey Ocean Foundation: The Guy Harvey Ocean Foundation (GHOF) conducts scientific research and hosts educational programs aimed at conserving the marine environment. The GHOF also funds affiliated researchers working to better understand our ocean ecosystem and educators helping to foster the next era of marine conservationists. The GHOF will help ensure that future generations can enjoy and benefit from a properly balanced ocean ecosystem. Please visit www.GHOF.org for more information.